The city where I was born and grew up, Trondheim, has lagged behind when it comes to beer. The scene is dominated by Carlsberg subsidiary E.C. Dahls bryggeri, and they have not shown any signs of innovation for decades (if ever?). I am happy to report that things are rapidly changing. There is an annual food festival in Trondheim at the beginning of August, showcasing regional produce, including fish and game, fruit and vegetables, cheeses and preserves. I have blogged briefly about this before, suggesting that beer should be included as a part of the festival. A few of the micro breweries in the region are brewed on farms, so they fit very well in, and they are finding their way into some of the stalls, both Inderøy and Klostergården beers are to be found in the main festival area. New this year is a separate beer festival, Trondheim Bryggerifestival. 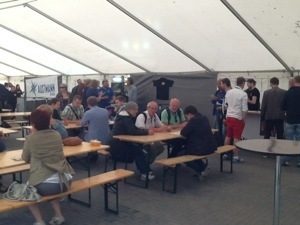 In a separate tent and with a 100 kroner entrance fee, you get to sample a fine range of beers, most of them Norwegian. Nøgne Ø, Haandbryggeriet, Ægir and Kinn are there, so you get the best of the established national craft breweries. But there are two others that merit special attention. 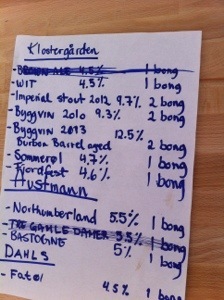 I blogged about Klostergården Håndbryggeri after my visit there in May. They have brought along a splendid range of brews for the festival, from a highly refreshing summer beer at 4.5% ABV to a barley wine aged in bourbon barrels at 12.5%. My current favourite among Norwegian breweries. There is also a brand new micro in Trondheim, who will have national distribution from the very start. Austmann Bryggeri go for sessionable beers with a moderate alcohol level. They had two different saisons and a brown ale on tap yesterday, all very respectable. The festival is staffed by volunteers, but several of the breweries are presnt, giving talks and hanging out to talk to the drinkers. Some minor details could be adjusted. I’d like a souvernir glass instead of plastic samples, and a full beer list with descriptions would also be welcome. But the important thing is that the festival is there to promote craft beer in the region, I hope they draw enogh people to make this an annual event.